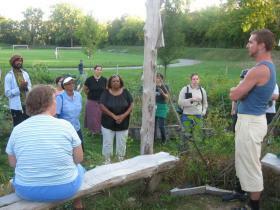 Participants in the Tour de Fresh explore and learn about the Frog Island Community Garden Tuesday night. The tour is put on annually by local non-profit Growing Hope. Sep. 16, 2009 · 10:53 a.m.
By bike or by bus, area residents toured around Ypsilanti Tuesday night to check out local gardens in the community. Approximately 30 people turned out to Growing Hope’s Tour de Fresh, which featured ten community and personal gardens throughout Ypsilanti. “It’s neat to have people come together and showcase what people are doing,” said Amanda Edmonds, director of Growing Hope. Growing Hope is a local non-profit organization dedicated to helping people improve their lives and communities through gardening and access to healthy food. Edmonds said the tour, in its third year, allows people to see some of the work Growing Hope has done and get involved, while giving the chance for people already growing personal plots and community gardens to get connected to each other. She said the organization has helped start 40 community gardens in the area, as well as 240 raised beds for some 80 low income families. The community gardens are started in neighborhoods, schools and churches. She said Growing Hope helps install raised beds for families as well, and tracks and measures food production from those family gardens. The tour started behind Towne Center Place, a high-rise downtown for low-income seniors. Edmonds said the group had helped Sigrid Melvin install a raised bed-garden for her in the fall, which sparked an interest among other residents. Edmonds said Growing Hope has since helped nearly ten residents construct gardens for themselves. The tour also stopped at the Frog Island Community Garden, which is in its third growing season. Launched by local residents with help from Growing Hope, the garden is located at the north end of the park and is open to all city residents. The garden launched with 13 personal plots, and now contains 23 and is at full capacity. The garden operates through local residents renting a plot in the park, based on a sliding fee. It features a natural meeting place in the middle and a shed on the north end that holds tools and a 1,000-gallon reservoir for watering plants. Filled once a year through a spigot in the park, the tank is also fed through a rain collection system using runoff from the shed’s roof. Amanda Betzler, a local resident who helps coordinate the garden, said she will start organizing next year’s gardeners some time in February. She said there is some turn over, but current gardeners will have first pick for next year. Betzler said the garden has been running well, but there are some improvements they want to make and some kinks to work out. The group wants to add some mulch to communal locations, level some land and get their composting system ironed out. The garden has also seen some thievery, Betzler said. She said it is has grown to become quite the concern among gardeners, who may come to find fruits and vegetables missing after working hard to cultivate them. She said the problem varies from person to person, and hasn’t affected her as much as others. She said she often picks her crop before they are totally ripe. To curb the problem, Betzler said people are encouraged to post signs in their gardens to inform people that the space is private. There is a waddell fence that surrounds approximately 30 percent of the garden on its east side. Betzler said the group is looking to install more waddell fencing on the garden’s west side. However, she said there is a fine line, as the garden is located in a city park. “We don’t own this land,” she said. All of the work that has been done in the garden, Betzler said, can be easily removed if the need arises. Another community garden on the tour was one started by Growing Hope for Chidester Place residents. “It’s really come a long way,” Edmonds said. In its sixth year, the garden was actually started before Growing Hope had been finalized as an organization. Edmonds said the garden has grown a lot since it was started, and residents have actually started to mark their plots with flags. “They’ve done an amazing job owning their space,” Edmonds said. Other stops on the tour included the Messias Community Garden, Parkridge Community Garden, two personal gardens, the Growing Hope Center and two drop-ins at the Thomason Family Farm – home to chickens and goats – and the Bashert residents – home to a honey bee apiary.